Almost nudging the ton the fleet will have a tail of 2 Orma 60′s for at least the first hour or or so of the race. Team Australia and team Vodafone (NZ) will start behind the Maxi’s and crusing divisions but will likely pass the majority of the fleet in the first few hours. Team Australia holds the passage record and the two multi hulls will likely take the unofficial line honours from the Super Maxi’s. The Clipper round the World boats have added an additional 25 boats to the fleet and will certainly add to the spectable. After a window in the weather opened up eventually the fleet in the Mini Transat got underway. After on 24hrs at sea the fleet was instructed to head for shelter. as the first leg was abandoned about one 3rd of the way to sada. Australian Richard Hewson was fairing well in the top 15 and Katrina Ham was in 49th place. After steering, designing and building the fastest foiling, wing powered boat in the world earlier this year, Paul Larson is in ‘unofficial’ talks with Hamilton Island Yacht Club. 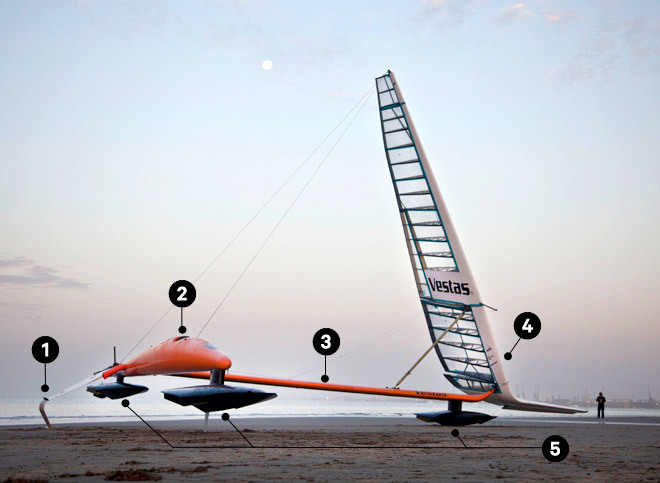 This is great for the challenger in that the Sail Rocket is the absolute peak of foil development, both above and below the waterline. As we saw in America’s Cup 35, foil development and use was the key differentiator for the Defender. Gotta Love it 7′s new Hull get’s rigged. The distinctive Red is back as the now 5 year old is passed down the ranks. The Big Fella is still looking over operations at The Woolwich dock head quarters. Their first outing was rudely interrupted by a Southerly that caused all racing to be cancelled on Sunday. A bit of a pattern for the week. After the America’s Cup win with Oracle the next big challenge for tom Slingsby is aboard Anthony Bell’s Loyal. Of the Super maxi’s this may be the force that Wild Oats XI will need to reckon with. Iain Murray (Strategist on WO XI) vs Tom Slingsby in 100ft Maxi’s should make for an interesting start – let’s hope for 10-15 knots Nor-Easter to get them started. A tactical start would certainly make them work for their lunch.